Today I have swatches of six beautiful holos from Black Dahlia. 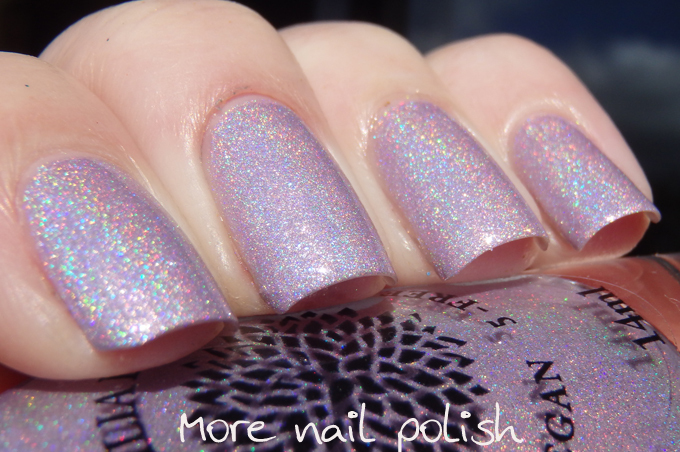 This six polish collection called Holo Petals has three linear and three scattered holos. The formula on all these was slightly thick, but easy to apply and nicely opaque. I only needed two thin coats of each to achieve opacity. All the polishes provide a wonderful mix of pigments and glitters creating unique and complex finishes. Let's take a look at each one. Lilacs in Lava - a pale lavender leaning steel blue scattered holo. The press release says it also has neon purple flakies and glass flecks that shift from red to orange to gold although they aren't something that really stand out, more so they just enhance and compliment the other ingredients to provide a stunning shimmery finish. Magical Moss - Silvered celery green linear holo with silver and aqua micro glitter and blue glass flecks. Moonlight Daisy - Royal blue scattered holo with blue, turquoise and silver micro glitter, red glass flecks and sapphire shimmer. I thought the gold was going to be my favourite of this bunch, and I chose to wear it first, but then I put this one one an whoa, it's a stunner! Mountain Laurel - Orchid pink linear holo with blue and purple glass flecks, and loaded with violet and aqua shimmer. Turquoise Hibiscus - Turquoise scattered holo with glass flecks that shift from violet to blue to green, and blue and green micro to small hex glitter. Polishes are available from http://blackdahlialacquer.com/ The scattered holos are $6.00USD for 8ml and 49.50 for 14ml. The linear holos are $6.75 for 8ml and $10.75 for 14ml.